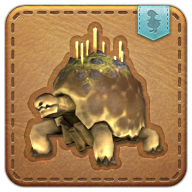 Summon your tiny tortoise minion. Will not carry you to an underwater kingdom if you ride on its back. Hatched from an egg laid in the ivory sands of La Noscea's Salt Strand, if lucky, this baby adamantoise may live to see as many as ten score summers...that is, if it does not accidentally launch itself off a cliff with its constant spinning. Reduces DEF of all enemies within range by 25%.